***ONE PRICE STOP!! NO HASSLE, NO HAGGLE CAR BUYING EXPERIENCE!!! *** WHEN IT COMES TO EXCELLENCE IN USED CAR SALES..YOU KNOW YOU'RE AT STAR AUTO MALL 512!!! WE SELL OUR VEHICLES AT WHOLESALE PRICES AND STAND BEHIND OUR CARS!!! ** FINANCING and WARRANTY is available on all our VEHICLES! Warranty available on this Vehicle for 3 months or 3,000 miles on Drive train. With a large inventory and wide selection of models, our GOAL is to help you make a CONFIDENT decision and buy the vehicle that's RIGHT for you. All vehicles are SERVICED, INSPECTED and DETAILED before they are ready to sell. We BUY, SELL and also do TRADE-IN's for all our customers. ALL our Vehicles come with 1YR STATE INSPECTION and EMISSION. WE will help you get a LOAN, either you come to us knowing the exact model and options you want with FINANCING in hand or haven't made your choice. AT Star Auto Mall 512 our FINANCE Department has access to loan programs designed to fit within your BUDGET. Perfect CREDIT, rough around the edges or NO CREDIT, WE ARE PREPARED AND WILL WORK HARD TO GET YOU FINANCED. Browse STAR AUTO MALL 512 CARFAX CERTIFIED Inventory @ www.starautomall512.com and to learn about our SUPER LOW PRICES/WEEKLY SPECIALS. Whether it's SALES or SERVICE, we've served people throughout the TRI STATE AREA and are EAGER to give you a VIP personalized experience in car buying. For any further question, please don't hesitate to call 484-898-8100 or email us at Sales@starautomall512.com Visit Star Auto Mall 512 online at starautomall512.com to see more pictures of this vehicle or call us at 484-848-8100 today to schedule your test drive. 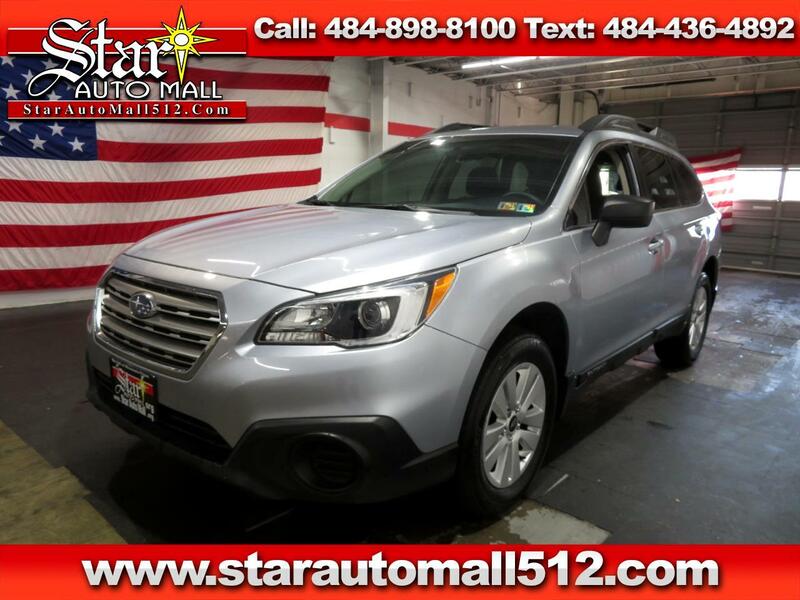 Message: Thought you might be interested in this 2017 Subaru Outback.